In the past five years, at least six New Yorkers have been killed, and many others injured, by truck drivers working for private trash haulers. Labor and environmental advocates have a plan they say will reduce these deaths by cutting down on inefficiencies in private trucking routes. They are meeting resistance from the waste hauling industry, which says safety can be improved without changing the current system of contracting. The de Blasio administration is now studying the issue. What will City Hall do? Garbage collection in New York is split in two parts. One piece is covered by the Department of Sanitation, which handles residential and government buildings. The other belongs to a constellation of more than 250 private haulers, which contract with individual businesses to collect commercial garbage. The private haulers cart more than half the city’s trash. The system for private trucking companies results in a lot of geographic overlap, with multiple contractors serving customers on the same block. In addition, private haulers often don’t use the nearest transfer station, instead driving across town to a facility where the company has a contract. Most of those transfer stations are in environmentally-burdened neighborhoods in the South Bronx, North Brooklyn, and southeast Queens. It all adds up to a lot of unnecessary mileage for big, dangerous vehicles, generating pollution, congestion, and danger for pedestrians and cyclists. Making matters worse, drivers of private trash trucks have an incentive to rush across town to keep on schedule. Some companies stretch their workers thin, advocates say, giving employees too many pick-ups across the city and not enough time to complete their overnight shifts, leading to reckless driving and drowsy drivers. A report prepared for DSNY by Halcrow Engineers in 2012 backs this up. It found that while companies typically “operate very efficient routes” to reach their far-flung customers, drivers often used “illegal right turns on red” and violated “one-way street restrictions” to speed up their shifts [PDF]. Enter the Transform Don’t Trash coalition, which includes members of the New York City Environmental Justice Alliance, New York Lawyers for the Public Interest, union-backed policy and organizing shop ALIGN, and the Teamsters. They say the city should rewrite the rules for private trash haulers and have companies bid for long-term contracts to serve specific neighborhoods. Not only would this system reduce truck mileage, advocates say, it would allow the city to more easily set and monitor labor and other standards, like how often old trucks must be replaced. Advocates point to other cities that have opted for this model in recent years, including Seattle, San Jose, and Los Angeles, where an environmental impact report projected that truck mileage will fall 2 percent after franchising is adopted [PDF]. If Los Angeles didn’t require additional trips for organics and recyclables under its new system, the reduction in mileage would be 16 percent, or 1.7 million miles each year. Trucks make up just 3.6 percent of vehicles on the road in New York City, but account for 12.3 percent of pedestrian fatalities and 32 percent of bicyclist fatalities, according to city data compiled by U.S. DOT. Even when adjusted for driving mileage, private haulers have a higher fatality rate than other truck drivers — two-thirds higher than DSNY drivers, according to a 1999 analysis of city traffic fatalities by Charles Komanoff. More recent data — covering not just safety, but also how much private haulers drive — is hard to find. Last month, the Business Integrity Commission, which regulates private haulers, required the companies to hand over data on routes and schedules. The number-crunching is part of a study of solid waste inefficiencies the de Blasio administration announced as part of its OneNYC environmental agenda. Changaris also pointed to his association’s support for the City Council’s recent bill requiring side guards, as well as weekly safety newsletters and voluntary additional driver certification the organization offers to its members. The de Blasio administration says its report will be released next spring. Advocates hope for action from the City Council and the administration soon after. Start with redesigning those trucks. The kind with the driver close to the street is much better than ones that put the driver high up and far from the front of the vehicle. Then they have too much work and need to hire more people, and/or haulers don’t charge enough. Costs are lowered by taking literal shortcuts, but the rest of us are paying for it. If your favorite restaurant was so busy that cooks didn’t have time to wash their hands, you wouldn’t be placated by excuses—you’d say to hire more folks to keep up with demand AND have the necessary safe food handling practices. Very happy to see reform on this front though! Garbage collection here seems so antiquated compared to other cities. Agreed. And start electrifying the fleet while we’re at it. Battery-electric drive is a great fit for vehicles which mostly go slow and stop/start a lot. How’s the electric garbage truck in Chicago working out ? You want a James Bond 007 license to kill in NYC? Go out an buy yourself a carting truck. If you really want to make sure you are immune to all laws put diplomatic license plates on it. Carting trucks operators can, if they so choose, break idle laws, never get traffic tickets, break NYC DEP and DOB rules with impunity. I have a question which may seem a little silly but why doesn’t NYC also pick up the commercial waste as well as residential waste? After all, these businesses pay taxes like everyone else. It seems to me this two-tiered system of private and public trash haulers shouldn’t even exist. And on another note what is NYC doing to actively reduce waste? I’m not talking about recycling. I’m talking about reducing waste, period. Every week I throw away 5 to 20 pounds of unwanted junk mail. This was stuff I never asked for and never should have gotten. It costs energy to make and deliver this stuff, and yet more energy to dispose of it. Moreover, since it served absolutely no purpose why aren’t measures being taken to eliminate it? Instead of opt-out lists for junk mail or telemarketing how about opt-in lists? To me it makes no sense to send out junk mail when you get a response rate of under 1%. Opt-in lists would mean only people truly interested would be on the mailing list. Even if it may make business sense under certain circumstances for mass junk mail, it makes no sense on any other level. 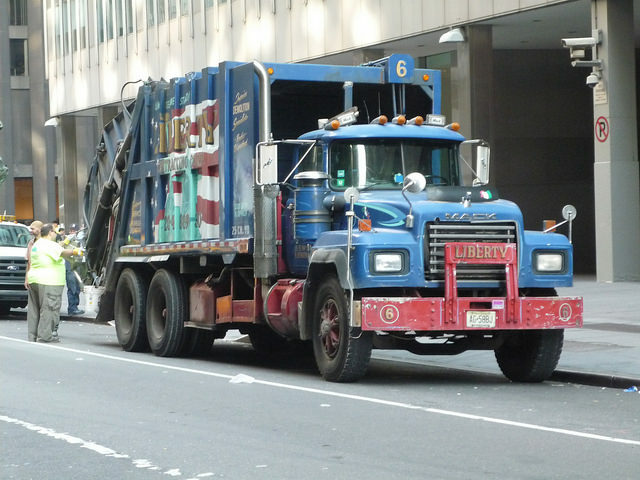 Less waste means fewer trash trucks plying the streets. Maybe that’s where we should focus our energies. End the junk mail streams, and also put a stop to overpackaging. You’re right that the bifurcated system leads to massive inefficiency, and a huge disparity between how workers are treated in the public sector versus the private sector of the waste collection system. DSNY is able to design rational routes (as the sole hauler of residential waste) while private carters are scrambling for customers and have cut worker pay, benefits, and safety measures in a “race to the bottom” to make inefficient routes profitable. Although I agree, commercial trash and residential trash really are different beasts. For example, many restaurants get trash pickup every night, as opposed to 2 times per week for residential buildings. Regarding junk mail, again I agree. However, if it weren’t profitable, they wouldn’t do it. Restaurants throw away an incredible amount of good food. In many cases it’s not even food which may have been on a customer’s plate. Perhaps NYC should at least get involved in picking up leftover food from restaurants each night, then serving the food to those who may need it the following day. On junk mail, remember if it is profitable in some cases it’s only because businesses don’t bear the cost of hauling it away. They also pay lower rates to mail it. We should charge first class rates for junk mail for starters. Maybe there should also be an additional fee added to cart it away. In any case, sure, the argument can be made that junk mail is profitable just as the telemarketing industry argues it’s profitable to make billions of unsolicited phone calls each year. This still doesn’t mean both things aren’t a major annoyance to the intended recipient. Thanks to the telemarketing industry, a friend of mine who was trying to reach me for weeks couldn’t. Unfortunately, their name didn’t appear on the caller ID. I’m in the habit of not picking up phone numbers I don’t recognize. I’m also in the habit of blocking those which call more than a few times. Fortunately my mom picked up and recognized the voice or this person never would have gotten through to me. Prior to telemarketing becoming such an annoyance I always picked up the phone. Mass junk mailings also have unintended consequences. More mail to be sorted/delivered means a greater chance my neighbors will get something important intended for me (or vice versa). Like I said, let’s go to op-in lists for both mail and phone advertising. Businesses might benefit as well knowing they’re only trying to reach a targeted audience. Should we franchise package delivery too? How about flower delivery? Or should food distributors be next? I watched five different beer distributors work one street in the Lower East Side this morning, maybe we should restrict their industries too? 1) City Harvest does exactly what you suggest with food. Support them. 2) I don’t think unwanted mail is a significant % of the waste stream. 3) Your suggestions re: postage rates, etc. would only serve to accelerate the bankruptcy of the USPS (I won’t argue whether that’s a good or bad thing, but it seems that in our consumerist society disposing of unwanted mail is probably somewhere around 811th, or lower, on the list of things that could be improved upon. Sure, lots of things in the waste stream might merit consideration prior to junk mail. I merely suggested junk mail because it’s annoying and intrusive in other ways. It also helps in part to foster consumerism which is the real source of excessive waste. I won’t get into it here other than to say consumerism, plus never-ending economic growth, both things modern economies hold as virtually sacrosanct, are totally incompatible with sustainability. Sooner or later we’ll have to restructure our societies around something else. I also wonder as 3D printing becomes common if it won’t help foster a far less wasteful society. Instead of buying new things which eventually end up as landfill you might be able to use your old, unwanted items as a source of raw materials for making new things. So long as the only major input is energy coming from renewable sources, such a system might be able to sustain high standards of living for everyone. The alternative is exhausting the planet’s resources before long, combined with wars over those dwindling resources. I was also curious how NYC wound up with this dual system of trash collection, and if other cities in the US use similar systems. I always assumed it was all municipal, rather than partially privatized. As a few other people here mentioned, commercial and residential trash often have far different requirements in terms of how often it needs to be collected, how much is generated, etc. It seems some municipalities did and do indeed collect commercial trash. However, there was mention of a 1994 Supreme Court decision which basically said municipalities can’t prevent private firms from competing for waste management contracts (no mention if that applied only to commercial waste, or also residential waste). My guess as to why it seems much commercial waste collection is privatized is because it’s a lot harder for municipalities to cut corners as private haulers do, and hence they just can’t easily compete on rates. Anyway, the article makes for interesting reading even if it doesn’t completely answer a lot of my questions. Franchising private haulers could fix a lot of the current problems, and also hold them to higher standards. Of course, it may also have the unintended consequence of increasing rates but that needs to be weighed against all the problems private haulers are creating under the current system which the taxpayers ultimately end up paying for. Even if you recycle, unless its the onsite waste to input material type, you still need to cart it away. Considering the paper recycling can be profitable, perhaps the USPS should get in on it. Frankly, from the point of view of running things properly, we *should* franchise delivery-by-motorized-truck. If you wanna deliver by handcart, deliver whereever you like… but truck congestion is a serious issue. New York City is the home of illegally-double-parked trucks… this alone indicates that there’s something really wrong with the way truck deliveries are done right now. While I agree it’s wasteful and drives me crazy, I don’t think junk mail is a great example of something a municipal government can control. The city should however expand the efforts to redistribute unused food and broaden things like the compost project, which I believe is still in testing phase. I’d love systems of reused glass bottles like many other countries have, but I’m not sure NYC could force Coca Cola to reuse bottles the way they do in Mexico, for example.